Composite materials are widely used in the Aircraft Industry and have allowed engineers to overcome obstacles that been me when using the materials individually. The constituent materials retain their identities in the composites and do not otherwise merge completely into each other. Together, the materials create a 'hybrid' material that has improved structural properties. Common composite materials used on airplanes include fiberglass, carbon fiber, and fiber-reinforced matrix systems or any combination of any of these. Of all these materials, fiberglass is the most common composite material and was first widely used in boats and automobiles in the 1950s. According to the Federal Aviation Agency, the composite material has been around since World War II. Over the years, this unique blend of material has become ever more popular, and today can be found in many different kinds of airplanes, as well as gliders. Aircraft structures are commonly made up of 50 to 70 percent composite material. Fiberglass was first used in aviation by Boeing in its passenger jet in the 1950s. When Boeing rolled out its new 787 Dreamliner in 2012, it boasted that the aircraft was 50 percent composite material. New aircraft rolling off the line today almost all incorporate some kind of composite material into their designs. 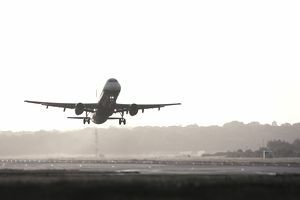 Although composites continue to be used with great frequency in the aviation industry due to their numerous advantages, some say that these materials also pose a safety risk to aviation. Below, we balance the scales and weigh the advantages and disadvantages of this material. Also, composite materials don't corrode as easily as other types of structures. They don't crack from metal fatigue and they hold up well in structural flexing environments. Composite designs also last longer than aluminum, which means fewer maintenance and repair costs. Because composite materials don’t break easily, that makes it hard to tell if the interior structure has been damaged at all and this, of course, is the single most concerning disadvantage for using the composite material. In contrast, because of aluminum bends and dents easily, it is quite easy to detect structural damage. Additionally, repairs can be much more difficult when a composite surface is damaged, which ultimately becomes costly. Also, the resin used in composite material weakens at temperatures as low as 150 degrees, making it important for these aircraft to take extra precautions to avoid fires. Fires involved with composite materials can release toxic fumes and micro-particles into the air, causing health risks. Temperatures above 300 degrees can cause structural failure. Finally, composite materials can be expensive, although it can be argued that the high initial costs are typically offset by long-term cost savings.